If you want a certain early 70s flavour, you'll find it here. 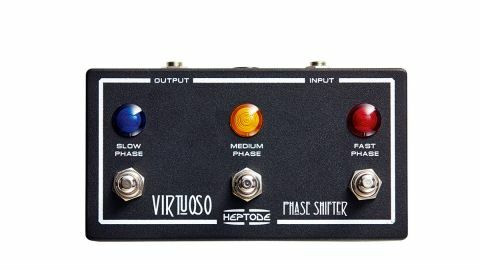 Where the original Maestro PS-1A was a beast of a pedal, Heptode's take cuts it down to a manageable footprint that's just right for housing three footswitches (each with a different coloured LED), but it remains rather tall at 70mm from the base of its rubber feet to the tip of a footswitch. We didn't miss a speed knob because the three speeds cover plenty of musical possibilities, and the option of changes on the fly is a great onstage asset with the speed ramping up or down when switched, as on the original. The phasing sound is thick and natural, sits well with guitar and features a unique complexity to the sweep with bags of vintage flavour. While we didn't have an original to compare sounds with, we reckon this pretty much nails it - when combined with our 1973 vintage 'Rams Head' Big Muff it was the nearest we got to that Isley Brothers tone than with any other phaser.